Captain Amsterdam E-Juice + CBD. Available in mouthwatering Jawbreaker Flavor. Strength: 60mg, 100mg or 200mg. 15ML Total. Captain E-Juice + CBD contains 100% medicinal strength CBD Oil derived from pure cannabidiol. Always purified to perfection, as you would come to expect from Captain Amsterdam’s premium line of CBD products. Captain E-Juice + CBD is composed of food grade CBD, which is ideal for safely and discreetly dropping straight into your mouth. Any place, anytime! Captain E-Juice + CBD comes in mouthwatering “Jawbreaker” flavor, the same one used by Stone Brewery. Captain E-Juice + CBD is not overpowering with ‘earthy’ flavors, as other companies tend to be. Each bottle contains 15ML, enough for 1 week if used moderately. A tasty and fun way to reap the numerous health benefits of cannabidiol without ever feeling high or overly sedated. Cannabidiol is a cannabis compound extracted from the marijuana plant that is loaded with significant medical benefits. The unique feature is that CBD oil will not cause the user to feel stoned or high and can CBD can actually counteract the psychoactive effects of THC. CBD-rich cannabis is non-psychoactive, or less psychoactive than THC-dominant strains. This makes it an appealing option for patients looking for immediate and long-term relief without any of the negative side effects of traditional marijuana usage. When CBD is administered orally, onset typically occurs within 30 minutes and therapeutic effects can last up to 4 hours. 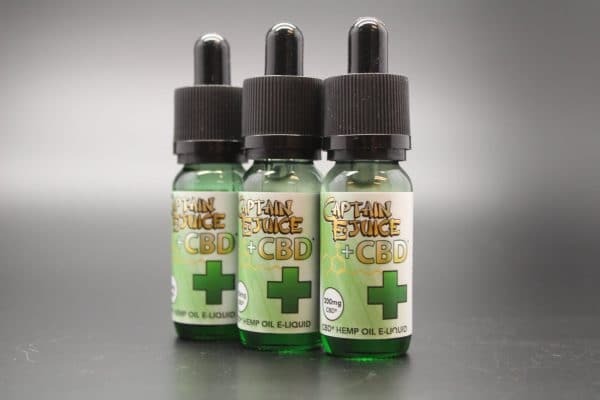 Captain E-Juice + CBD does not contain any THC and is not intended for children. American made and legal in all 50 states. Why Buy From from Salvia Extract? 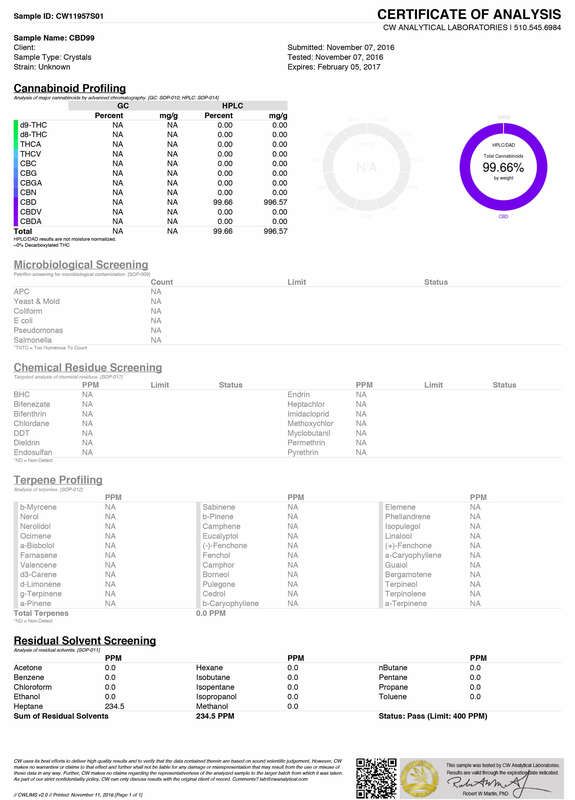 Thank you for shopping with SalviaExtract, and please remember us for all your CBD needs! We are accepting contributions for this product, and will display them when get a few more! Cannabidiol (CBD) is a substance found in hemp or cannabis. It belongs to the family of hemp-based substances called the cannabinoids, to which THC also belongs. Both substances offer medicinal benefits such as pain relief, neuroprotection, among other numerous uses. However, the difference between them lies in the fact that CBD does not have any psychoactive (recreational) effects like those found in THC. What are the best CBD intake portions? This has to do with several user-specific factors. The safest way to go about this is to start off with minimal dosages. For example, CBD gummies carry around 5mg of CBD per serving. Given that the safe dosage averages around 25mg per day give or take a few, 5 servings would give you the said dosage. Usually packages contain 200-400 mg of CBD per package, so with that dosage, a package should last from 8 to 16 days. Of course, the most advisable course is seeking professional medical guidance for the right dosage for your particular case. As with any medicinal drug, their is no ideal answer to this question. This has to do with several user-specific factors. The safest way to go about this is to start off with minimal dosages (i.e., 5 drops of CBD oil per day) and then gradually increase them according to your need. Safe dosages range around 15 drops per day, while some people go as high as 50 per day. Of course, the most advisable course is seeking professional medical guidance. How is CBD extracted from cannabis? First of all, you have to make sure that the hemp plant from which the extraction is done is a CBD-rich plant. The cannabis strains richest with CBD are the sativa strains (as opposed to THC-rich indica strains). Then comes the extraction process. There are several CBD extraction methods, such as using neurotoxic solvents (i.e., butane, hexane), ethanol (suitable for home-based extraction), or the more common CO2 extraction method. What exactly are the conditions treated using CBD? The medicinal uses of CBD are manifold. Treatment with CBD includes neurological, digestive, respiratory, and even psychological conditions, among others. Among the examples of physical conditions that CBD helps cure are epilepsy, skin diseases, sore muscles, and nerve inflammation. It also facilitates faster healing of wounds. The psychological conditions most commonly treated with CBD are anxiety, depression, and PTSD. What, are the most common forms of CBD? CBD comes in several forms and is used with a wide range of methods, but the single most common form is CBD oil. Firstly, that is because oil is the most effective and concentrated form of the substance. It is also the form most available at reliable outlets. CBD also comes in the form of patches, salves, balms, and creams. Are CBD products and extracts legal? In the United States on a federal level, hemp-based products, like hemp oil or edibles, are perfectly legal. That means that CBD (which is found in hemp) and its various products are legal to buy in all 50 states because, unlike THC-rich marijuana, CBD is not a psychoactive drug, but is rather used therapeutically. In Canada, obtaining CBD extracts legally requires them being subject to the federal Marihuana for Medical Purposes Regulations (MMPR) program. Unlike THC-rich products, CBD-dominant strains (hemp) are legal on the federal level. In all ten provinces there are dispensaries and stories that legally sell CBD oil and other hemp-based products, albeit to people with a medical prescription. Can CBD intake affect other drugs the user is taking? Indeed it does. The cytochrome P450 enzyme (the same enzyme present in grapefruits) is present in CBD. This enzyme is the reason why the consumption of grapefruits is inadvisable right before or right after the use of any medicine. The cytochrome P450 enzyme might either diminish or magnify the effects of the taken drug, and so it is recommended to have blood components checked by a physician before seeking CBD treatment. How are the body effects of CBD ? CBD activates receptors in the brain such as the vanilloid and adenosine. It also balances the temperature of the body and the perception of pain. That occurs by its activation of the TRPV-1 receptors. CBD also neutralizes the psychoactive effects of THC. Furthermore, it activates adenosine receptors which are responsible for releasing dopamine and glutamate, thus reducing any feelings of anxiety or inflammation. These are only its major effects. CBD is considered to be generally safe with little to no side effects experienced by most users. However, there are some that might occur (albeit with low frequency) such as a decrease in drug metabolism, a dry mouth, a decrease in blood pressure, lightheadedness, and other similar mild effects. For Parkinson’s patients, there might be an increase in tremor. A consultation with your physician before using CBD is always recommended.